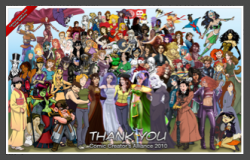 The Comic Creator’s Alliance donation drive, fighting human trafficking with webcomics, ends Sunday. Throw in a couple bucks & get a keen wallpaper if you haven’t already! Visit comicalliance.weebly.com. This entry was posted on Thursday, January 21st, 2010 at 9:25 pm and is filed under Blog. You can follow any responses to this entry through the RSS 2.0 feed. You can leave a response, or trackback from your own site.